That's going to be a key factor in how much of the 2017 Total Eclipse you will actually be able to see. 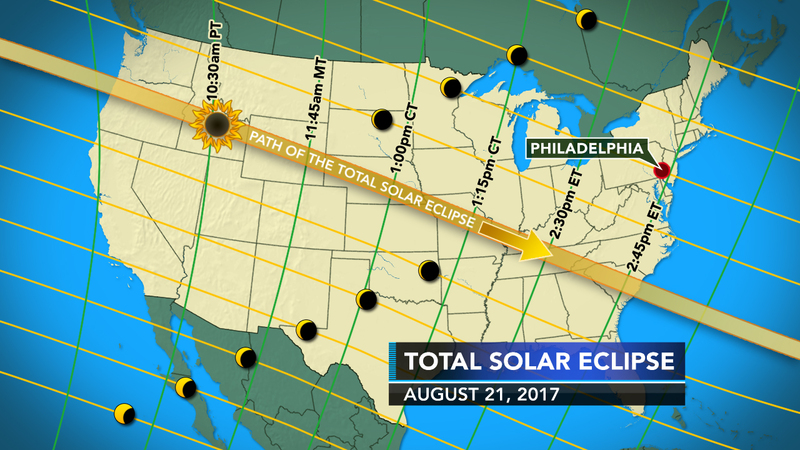 On August 21st, the contiguous United States will see its first total eclipse since 1979. The path in which the moon will truly block 100% of the sun will only be about 70 miles wide and will run from northern Oregon, southeast through Nebraska and Missouri to South Carolina. But if you aren't along that path, don't despair. Throughout the Delaware Valley, sky watchers can still expect to see about 75% of the sun blocked by the moon, right in the middle of the day at 2:45. Even the northern-most tip of Maine will get almost a 50% eclipse. Use the map above to figure out what time the eclipse will happen in different parts of the country. Wherever you are, remember, do not look directly at the eclipse without protection. Click here for tips on how to watch the eclipse safely.